Guardzilla has eyes even when you don’t! 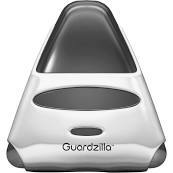 Home » Business » Guardzilla has eyes even when you don’t! Look familiar? Well this device started showing up in all the big box retailers last year so we decided to give one a try. Hooking the device up to a EVDO hotspot on Verizon was interesting at best. During our testing we discovered that the device streams continuously back to Guardzilla (even if you don’t subscribe to their monitoring) all the time. So this “security” device has some serious “privacy” issues. Here’s the problem. Even when you don’t subscribe to the recording and playback features offered by Guardzilla the devices still stream to Guardzilla and we assume that the video is being stored otherwise why would you send it? What tipped us off was the fact that the device uses nearly 1GB of bandwidth per day even when your not viewing the camera. So basically your allowing Guardzilla to see into your protected space and to hear everything that goes on in this space because these devices are constantly streaming even when you are not using them. Read more on SLC Security. In an update, they state that Guardzilla confirmed that that’s how the device operates. I wonder what the FTC would say about all this. It wouldn’t surprise me to discover that Guardzilla was created with the help of DHS. At the very least I bet DHS/Police will embrace it, like they have VACCINE’ surveillance.